It's a perfect day for a trip to the shore. This easy sundress sewing pattern features button straps, princess seams, and two almost-invisible little pockets at the dropped waist which are perfect for stashing tiny treasures. Share your photos on Instagram with the hashtags #seashoresundress and #oliverands. 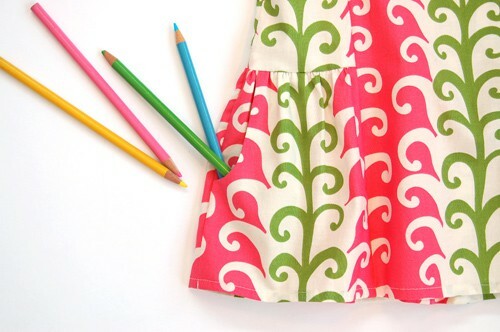 Girl's sundress pattern. 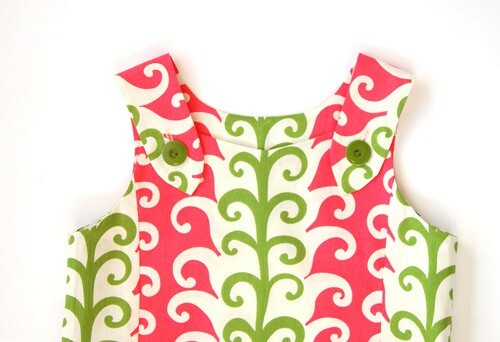 This easy sundress pattern features straps that button, princess seams, and two tiny treasure pockets at the dropped waist which are perfect for stashing a favorite pebble or seashell. Bloomers (sizes 6M-4 only): Coordinating thread, 1 yard of 1/4" elastic, 1 yard of 1/2" elastic. I have made 2 of these dresses for my great nieces. 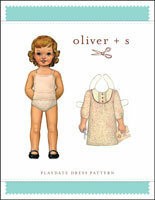 As I have come to expect from O&S, the directions are so clear and the pattern so well designed that it was a pleasure to sew. 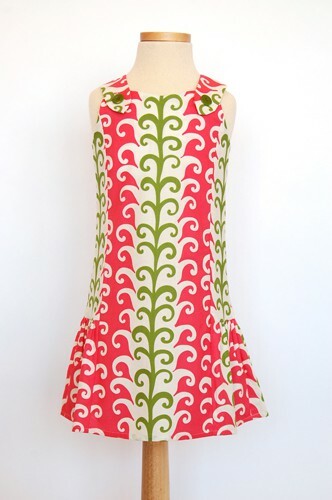 I made this dress for a friend's daughter and am making a larger size now. I'm in between the 1 and 2 scissor skill level, so a pretty beginner sewer still. I found the instructions very clear and appreciated all of the details that make the dress look so professional. My friend found that the pattern runs a little small - I sewed the 18-24 month size for her daughter's birthday and she outgrew it before she turned 18 months, despite just starting to fit in to commercial 18 month clothes right at 18 months. This was a great pattern. It went together perfectly and looks super cute on my grand daughter. Making this dress was a very enjoyable experience. The pattern and instructions are clear and easy to understand and the finished garment is just beautiful. Sorry, I can't good write English. I like this dress. One of my blogger friends has sewn it some times and she's excited about all your patterns. I trust in her opinion and hope I'll find time to sew it for my grandchild. 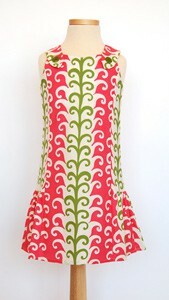 I am making this dress out of Cinderberry's Maya mermaid fabric, with pink piping, for my two granddaughters. They are so excited to be able to wear these to the beach (as is their mom and ME!). I really enjoyed using this pattern and my three granddaughters are really enjoying wearing their new dresses. It's a style that lends itself easily to 2 co-ordinating fabrics as different panels can be cut in matching fabrics or the skirt can be in s contrasting fabric. It was also useful to learn how to do pockets and good practice for button holes. Learn as you sew and experiment a little. The instructions on this were so easy to follow, I was able to make this dress easily in just a few sittings and it looks amazing. I learned how to do princess seams and pockets for the first time. I really recommend this pattern, and my daughter loves her finished dress. The only slight thing I would change next time I make the dress is the length - it is a little short on my daughter, but she prefers to wear her dresses with leggings anyway. She wants me to make her another one! And I can make that happen with the greatest of ease. This is a wonderful pattern for a novice like me. Quick and easy but the results are absolutely fabulous. It's a beatiful and easy to sew dress, I've already sewn 2 of them! The only point could be that it's quite a strech model, and if youre girl is not thin, you should go for a bigger size and shorten the bodice part (easy!)! Thanks O+S! I had a great time and my girl loves them!! 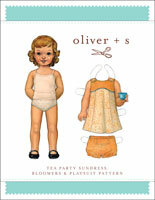 Discussion on the digital seashore sundress sewing pattern from the Oliver + S Discussion Forums. Find and share more photos on Instagram using the hashtags #seashoresundress and #oliverands.